Author(s): Thomas Kieber-Emmons, Department of Pathology, University of Arkansas for Medical Sciences and the Winthrop P. Rockefeller Cancer Institute. 4301 West Markham St., #824, Little Rock AR 72205 USA. Angela Pennisi, Anna Lane, Eric Siegel, Martin Cannon, Behjatolah Monzavi-Karbassi, Issam Makhoul. This review discusses the concept of expectations in assessing direct benefit to participants in phase I immunotherapy studies. With the push toward a faster assessment of clinical benefit or efficacy, limiting phase I studies to safety determination only is now viewed as obsolete and has been replaced by designs that draw attention to therapeutic benefit or efficacy. While this approach is touted as being more flexible in trial conduct, these designs are particularly problematic for immunotherapy studies. Defining and managing expectations is paramount on understanding the key axioms that emerge that include i) understanding bias in models and mechanistic results, ii) that no test is perfect, iii) it is difficult to select a good predictive biomarker in the absence of clinical data, even for targeted therapies, iv) markers predictive for monotherapy may not be predictive for combination therapy, and v) all about improved patient selection. Considering the heterogeneity of cancers and the immune response of the host, we think that immunotherapy should be developed in parallel with the identification of different clinico-pathological models of immune response to cancer. This approach would accomplish two important goals: 1) provide a biological understanding of the complete in vivo environment, thereby giving investigators the opportunity to optimize and maximize the effect of a specific immunotherapy agent and 2) addressing host environment issues simultaneously so that safety data and perceived benefit can be achieved more quickly. Keywords: Cancer clinical trial, Clinical benefit, Early phase trial design, Efficacy, Immunotherapy, Monoclonal Antibody, Vaccine. Affiliation:Department of Pathology, University of Arkansas for Medical Sciences and the Winthrop P. Rockefeller Cancer Institute. 4301 West Markham St., #824, Little Rock AR 72205 USA. Keywords:Cancer clinical trial, Clinical benefit, Early phase trial design, Efficacy, Immunotherapy, Monoclonal Antibody, Vaccine. Abstract:This review discusses the concept of expectations in assessing direct benefit to participants in phase I immunotherapy studies. With the push toward a faster assessment of clinical benefit or efficacy, limiting phase I studies to safety determination only is now viewed as obsolete and has been replaced by designs that draw attention to therapeutic benefit or efficacy. While this approach is touted as being more flexible in trial conduct, these designs are particularly problematic for immunotherapy studies. 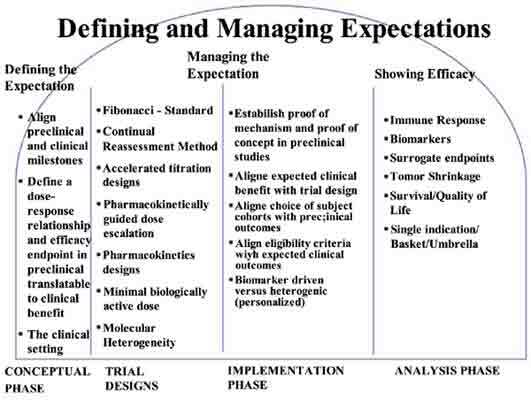 Defining and managing expectations is paramount on understanding the key axioms that emerge that include i) understanding bias in models and mechanistic results, ii) that no test is perfect, iii) it is difficult to select a good predictive biomarker in the absence of clinical data, even for targeted therapies, iv) markers predictive for monotherapy may not be predictive for combination therapy, and v) all about improved patient selection. Considering the heterogeneity of cancers and the immune response of the host, we think that immunotherapy should be developed in parallel with the identification of different clinico-pathological models of immune response to cancer. This approach would accomplish two important goals: 1) provide a biological understanding of the complete in vivo environment, thereby giving investigators the opportunity to optimize and maximize the effect of a specific immunotherapy agent and 2) addressing host environment issues simultaneously so that safety data and perceived benefit can be achieved more quickly.